A visual library of food. In the 15 years we have lived in New York, we have inhabited no less than 5 apartments. None perfect, but each with their own special feature and random quirk. Our first apartment in Brooklyn was sunny and spacious and even had a proper dining room, but you had to walk through the bedroom to get to the kitchen. After that, we moved into an apartment with a lovely kitchen and a large walk-in closet in the bedroom (Oh closet! How I miss you so), but the livingroom/dining area – if you could call it that – was about the same size as the closet. Thus, you could could easily cook a glorious meal, but it was hard to invite more than two people for dinner. Our last three apartments have all been in the same building, the first was a one-bedroom, but with a proper entryway; the second had a beautiful window and open kitchen, but was still small for a family of four. We now have ample space, but the trade-off is a small galley kitchen, clearly designed by someone who uses their own oven to store shoes. With the help of IKEA, we did our best to maximize the space we have when we moved in and I consoled myself with knowing that none other than Mark Bittman suffered from the same problem. Tiny as our cabinets are, we somehow managed to cram so much into them we didn’t know what we had. So over the recent holiday break, I decided to excavate. I found no less than 4 small bottles of peanut oil, conjuring up the several moments in the recent past when – in a mid-cooking freak-out – we couldn’t find it, assumed we were out, and ran to the store to buy more. There were also many a bottle of random and expired condiments (apparently in the early 2000’s we once used a bottle of A-1 steak sauce and then kept it for posterity after it expired in 2008). But the most surprising were the endless bags of legumes that emerged from the cabinet above the stove. Once I got it all out, it was clear that it couldn’t go back. 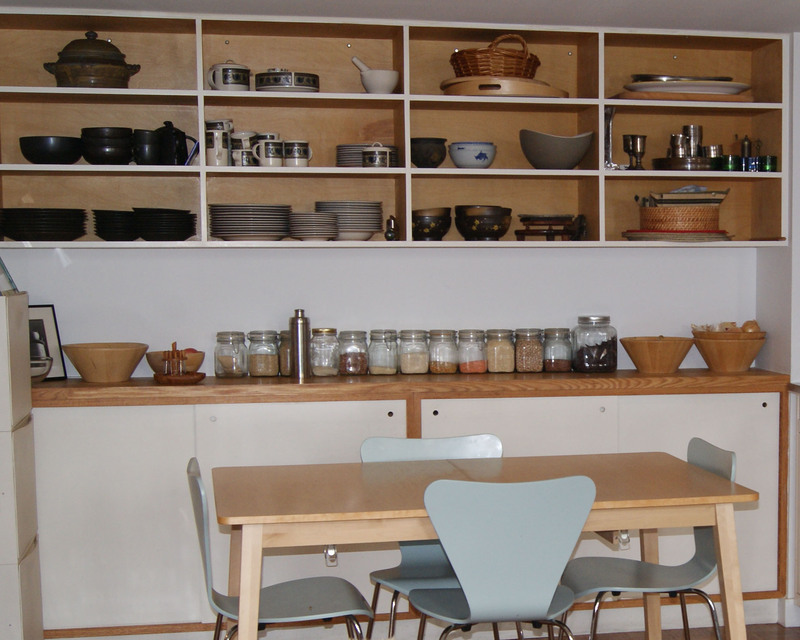 Lucky for us, the previous tenants had addressed the small-kitchen problem by installing a large built-in next to it in the dining area, where I had a few jars filled with foods we use on a daily basis. Foods we used because we could actually see them. Of course, the answer was there all along – more jars! I set about trying for find more of what I originally had, when I stumbled across a set of stackable glass canisters produced by Anchor Hocking. To my amazement, they fit our space exactly. It took 48 jars to cover the entire space and I was worried about how I would fill them all. Silly me. Apparently, I had more than 48 different kinds of beans, grains, pasta, nuts living above my stove. But now we can see them all and are actually using them. Our kitchen has now been fully cataloged and is ready to take on our recent declaration that we are going to make a whole bunch of stuff this year. In the meantime, our new dry-goods library has inspired us to eat more cholent. So, for all of you out there with tiny kitchens, what clever tricks are you using to make them work? Adapted from “Quick & Kosher: Recipes From the Bride Who Knew Nothing,” by Jamie Geller (Feldheim, 2007). Via the New York Times, published November 23rd, 2010. 1. Line the bottom of a slow cooker with the potatoes, the onion and then the short ribs, sprinkling the meat with pepper to taste. 2. Scatter the barley and the beans on top, then pour on the broth and the honey or molasses. Sprinkle with the paprika and salt to taste. Add enough water to cover all the ingredients. Cook on low for 12 to 15 hours, stirring occasionally (except during Shabbat, for those who observe it), adding more water if necessary. The longer the cholent cooks, the better it will be. Yield: 6 to 8 servings. This entry was posted on January 19, 2011, 8:35 am and is filed under design, home, kitchen, Organize. You can follow any responses to this entry through RSS 2.0. You can leave a response, or trackback from your own site. Love the new look! 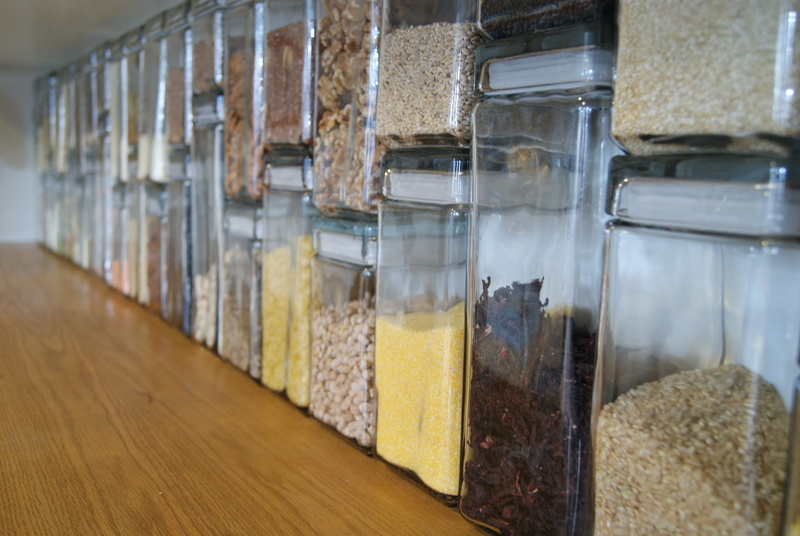 We use old jars to store our various grains. We find the jars to fit perfectly in an area that may have been meant for wine. (Beans are much cheaper.) Looking forward to the cholent. Kim – Would love to see a picture of your beans in the wine storage! Sounds like a clever solution to a very NYC problem. Love it! I need to do something like this. gorgeous kitchen!!!! Can you help me now? I didn’t realize that we were there close to witness the birth of the jars. What good fortune. Fabulous post. We miss you and the jars and the girls. Hi Sara – I find your blog beautiful and inspiring and appreciate your comment. This is awesome and inspiring. We too have a little galley kitchen and it annoys me how much it consumes that we never use or see again. So much it kept on the fear of “what if . . ” UGH! I absolutely love the built-in! We inherited the built-in and it is my favorite part of the apartment. 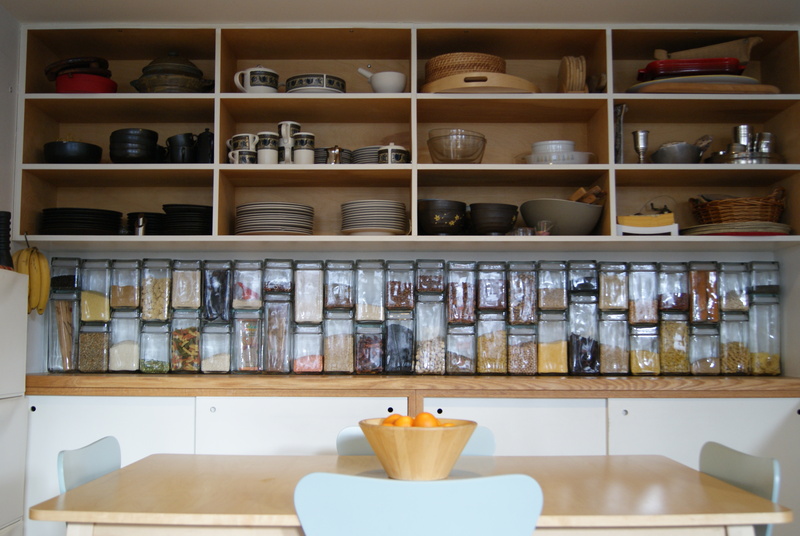 When we first installed the jars and it was posted on Apartment Therapy, the question was whether or not stuff would “go bad” in them. After a year of use, I can say that it has been nothing but positive. The food stays fresh and we use it so much more because we can see it. It has definitely had an effect on how we cook. So I say, go for it!